ice_5.1.8 is now available in the test repo. Tool to create Chromium/Chrome/Firefox SSBs (site-specific browser). Currently it has support for chromium, chrome and firefox. We are looking for testers so please give it a try and let us know how it goes. I'm particularly interested in someone trying it if they have both slimjet and chrome installed. 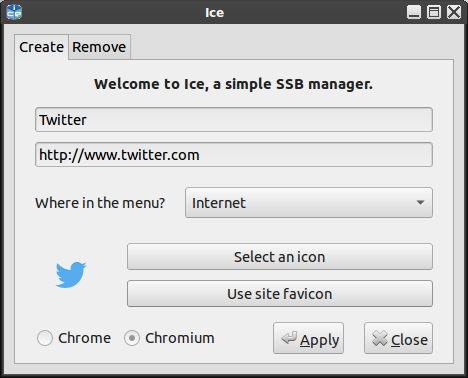 I have both installed and it would try and launch my ssb, that was created with chrome, in slimjet, but since slimjet is not supported in would not launch. Reinstalling chrome solved the issue for me, but would like to know if this is reproducible. Last edited by v3g4n on Sun Jan 15, 2017 1:27 pm, edited 1 time in total. I cannot get it to work at all. Both Slimjet and Google Chrome installed. Reinstalling Google Chrome had no affect. What does an ssb do other than hide all the browser's toolbars? GuiGuy wrote: I am puzzled by this. Also no extensions apparently or other browser goodies. Frankly I do not see much utility in it. What exactly does this mean, ice won't launch at all? Your ssb wont launch? Would you be able to look in your ~/.xsession-errors and post any feeback that you are getting involving ice? Also do you have callibre installed? If you do could you try reinstalling that as well? I ended up removing both calibre and slimjet and then my ssb created by ice would work. Then I reinstalled both and it still works. I decided to remove those two temporarily because I was noticing errors in my ~/.xsession-errors about both when I would try and launch my netflix ssb. Thank you for testing. I was hoping you would because I've seen in other posts that you are using slimjet also. SSBs allow an application to function in more of a standalone method than running them directly through the web browser. In addition they allow for the user to take advantage of additional screen space as they don't include all the functions and menus of a browser. Do I personally find much utility in it? No, but I'm guessing my 70 year old mother in law that just wants to get on Netflix or something like that And doesn't use a computer much might. The ssb's created for Google Chrome do not load, Firefox created ones do. I do not have Calibre installed. ~/.xsession-errors has several lines of this error. Did you have to mention 70 year old, says this soon to be 71 year old. You are just a youngster, Rich! I've also had no issues with Firefox created ssb. Only with the chrome ones. Thanks for posting rich I'll look into it more later, at work right now. That is not the errors I was getting so the confusion continues.